Midnyte Reader: Haunted - Audio. 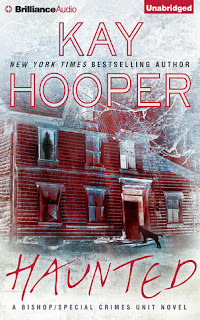 Title/Author: Haunted (A Bishop/SCU Novel #15) by Kay Hooper. Synopsis: When Deacon James's younger sister Melanie calls him, terrified, he goes to her aid in the small Georgia town of Sociable. What he finds is a sacred young woman in the grip of what she insists is a paranormal nightmare -- and murder. Two local men have been killed under mysterious circumstances. And Melanie is the prime suspect. Midnyte Thoughts: I had high hopes for this book. Unfortunately, they weren't met. Part of it was my own fault as I didn't realize this was part of a series. I was confused by the cast of characters and had a hard time keeping up with who was who. I see now it is number 15 in the series. 15!!! I missed a lot. I missed the world that was created, a lot of key plot points, history, relationships and the personalities of a few of the main characters. However, whether a book is number 1, number 6, or number 15 in a series I would like it to engage me. Haunted did not. I had no real interest or empathy for the characters and they seemed interchangeable at a lot of parts. There was a lot of explaining and telling in this book and while it did reference to events that happened in the past, it didn't do so in a very interesting way. There was a lot of telling and going over the past, which while appreciated to fill in some gaps, it didn't make for a very compelling story. I also think part of my lack of enjoyment in this book is because whenever a scary part was about to take place, I was expecting a lot more. To me, there was nothing very frightening going on. Just some murder and possession -- I think I'm too jaded! But I felt there was no tension and it could have been ramped up. I'm supposing my idea of the book being scary and gory is not the same as the author's (and that's okay). It just simply didn't work for me. Narration: I felt the diction was very clear and succinct and the author managed to differentiate between male and female characters very well. However, the voices still didn't always work. I thought the speech was so deliberate that a lot of it didn't feel natural to me. However, if you like an easy book to read, you may want to try this series from the beginning. I think people who want a "safe" scare may appreciate these books. I also love how the author advocated for animal rescue and even based a dog in the book, Braden, after a dog she "met." Now this was part of the book that really touched me. A light supernatural murder mystery.